Overlapping communities structures could effectively reveal the internal relationships in real networks, especially on the ownership problems on the nodes in overlapping areas between communities. Hence, the overlapping community detection research becomes a hotspot topic on graph mining in the decade, while the local expansion methods based on structural fitness function could simultaneously discover overlapped and hierarchical structures. 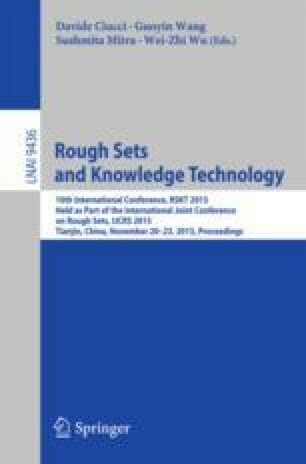 Aimed at community drift and redundant calculation problems on general local expansion methods, the paper presents a novel local expansion method based on rough neighborhood that carries out the heuristic technology by the community seed inspiration and the triangle optimization on the boundary domain. The method could directly generate natural overlaps between communities, reduce the computational complexity and improve the detection on the overlapped boundary area. Finally, the experimental results on some real networks also show that the rough expansion method based on triangle optimization could be more effective in detecting the overlapping structures. The research is supported by the Creative Research Groups and the Qualified Personnel Foundation of Taiyuan University of Technology of China (Grant No. 2014TD056), the National Natural Science Foundation of China (No. 61503273 and 61403329) and General Program (No. 61175054), and the Natural Science Foundation of Shandong Province (No. ZR2013FQ020).